Works started today to resolve the recurring flooding problem under Sturt Road railway bridge, and associated road surface deterioration due to constant subsurface water saturation. Project started as programmed end of 2016, but discovered a number of water leaks in Thames water pipes under this section of road, so project halted until repairs carried out. Project then had to be rescheduled on program list, resulting in delay. Work that started today = hand digging out trench as electricity and gas mains pipes to be avoided. Aim to lay new 150 mm pipe under Sturt Road to connect existing gullies, so that runoff is removed from the road. Pipe will be laid and concreted in tomorrow, 16/03/2017. Road resurfaced 17/03/2017. Road will be closed with diversions in place until 18/03/2017- but still full access to Haslemere Sports Centre and Sturt Road businesses. I have organised for a vegetation gang to come in while the road is closed to cut back vegetation, and clear mud and debris from the verges. This entry was posted in Haslemere first and tagged Haslemere, Road Repair, Sturt Road, Surrey County Council, Thames Water on March 15, 2017 by admin. 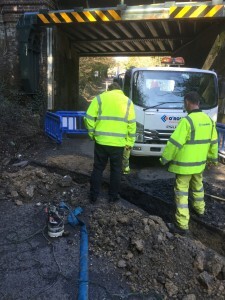 Recently advised that the drainage investigation works were due to start on Sturt Road, Haslemere. Unfortunately these works will be delayed by 1 day as the council was unable to get the permit for the 13/03/17. I can advise that these works will now begin on the 14/03/17. The council will keep the residents informed by updating its advanced warning signs. If you have any questions please do not hesitate to contact us on 0300 200 1003 or email works.communication@surreycc.gov.uk. This entry was posted in Haslemere first and tagged Drainage Investigation, Haslemere, Sturt Road, Surrey County Council on March 8, 2017 by admin. Sturt Road in Haslemere will be closed whilst Surrey County Council carries out resurfacing works. 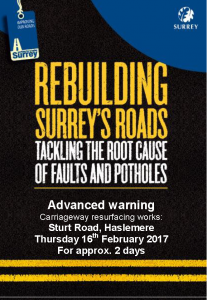 This entry was posted in Haslemere first and tagged Carriageway Repairs, Haslemere, Sturt Road, Surrey County Council on February 6, 2017 by admin. SURREY COUNTY COUNCIL PROPOSE TO MAKE the above mentioned Temporary Order (“this Order”) under Section 14(1) to the Road Traffic Regulation Act 1984 (“the Act”), the effect of which will be to temporarily prohibit vehicles from entering or proceeding in that length of (A287) Sturt Road, Haslemere, between its junction with (B2131) Liphook Road and its junction with the access road used to enter The Herons Swimming and Fitness Centre, a distance of 175 metres. This Order is required to enable Network Rail to replace damaged warning chevrons at the railway bridge. These works are anticipated to be carried out over three nights between the hours of 21.30hrs and 05.30hrs from the 3rd November 2014 within the two-week period of operation of this Order that commences on 3rd November 2014. Advanced warning signs will be displayed and the temporary closure will only operate when the relevant traffic signs are displayed. Access will be maintained for pedestrians. No access to any property will be affected. Access will be maintained for emergency vehicles via the signed diversion route. Vehicular traffic will be diverted via Sturt Road, Midhurst Road, Shepherds Hill, Lower Street, Wey Hill, Lion Green, Junction Place and Liphook Road. This entry was posted in Haslemere first, Surrey News Updates and tagged A287, Haslemere, Sturt Road, Surrey County Council, Temporary Road Closure on October 30, 2014 by admin.